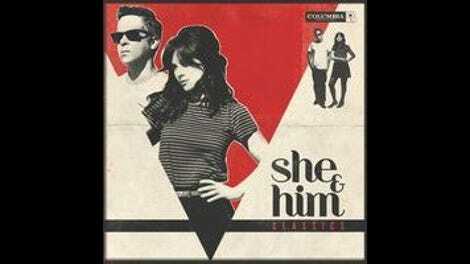 Conceptually, Classics is quintessential She & Him: The album’s 13 songs are jazz, country, and early rock ’n’ roll tunes popularized by artists such as Johnny Mathis, Frank Sinatra, the Righteous Brothers, and Dusty Springfield. To reinforce the throwback, black-and-white-movie vibe of Classics, the duo—guitarist M. Ward and vocalist Zooey Deschanel—recorded these songs live with a 20-piece orchestra that included brass, strings, piano, bass, flute, and drums. Naturally, the album sounds flawless, with each instrument crisp and distinct in the mix—from reverb-kissed guitar trembles and taut brushed drums to white-linen piano and Lawrence Welk-esque string schmaltz. Deschanel too thrives in this vintage-sounding environment, whether she’s emoting like a sassy Motown vocalist on the Springfield-recorded “Stay Awhile,” dipping into her velvety lower register on the Burt Bacharach and Hal David composition “This Girl’s In Love With You,” or belting out “I’ll Never Be Free” like a brassy torch singer. M. Ward even gets into the debonair spirit with a wry, wizened lead vocal turn on the plush “She,” a highlight that boasts sighing angelic backup harmonies and breezy brass solos. Yet for all of its impeccable arrangements, Classics almost feels too perfect, an album so stylized that it inadvertently suppresses the emotion inherent in these songs. That’s most evident on an almost dirge-like, hushed cover of “Unchained Melody,” whose stretched-out choruses and verses sound overdramatic rather than moving, and on a version of the playful Ella Fitzgerald & Louis Armstrong chestnut “Would You Like To Take A Walk?”; the latter song’s cheeky romantic sparring comes across as stiff and rushed, a one-sided flirtation rather than a real connection. Losing something in translation is the potential downside of interpreting beloved standards, and while She & Him are lovingly faithful performers, Classics ends up as just pleasant background music.